In 1955, Arnaldo Caprai set up a textile business which became one of the largest and most successful in Italy. A native of Umbria, in 1971 he bought a vineyard near Montefalco to fulfil his dream of reviving the fortunes of wine production in the area. 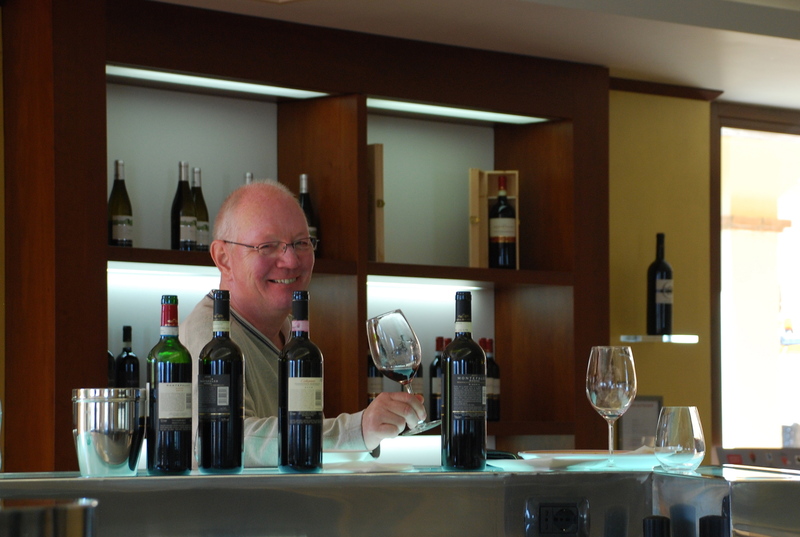 Arnaldo’s son, Marco Caprai, took over the management of the Winery in 1988 and he has modernised production methods without losing sight of the traditional values and techniques. He also collaborates with Milan University on research and experimentation to ensure a sustainable future in an ever-changing climate. Of the varieties of grapes cultivated here, the most revered is the Sagrantino, a variety that has been traced back 500 years and the one that produces the very finest of the Caprai wines. It has been said that the Caprai family has almost single-handedly reinvigorated the indigenous Sagrantino grape variety. Today the vineyards under cultivation extend to 137 hectares and the Winery produces 700,000 bottles each year. Surely some of them could be ours? To ensure that this was the case (no pun intended! ), off we went for a tour and wine tasting. The knowledgeable, patient and English-speaking Vivianne showed us around the fields and the production facility, explaining the history and cultivation methods. There are around 20,000 barrels in use, mostly made of French oak. 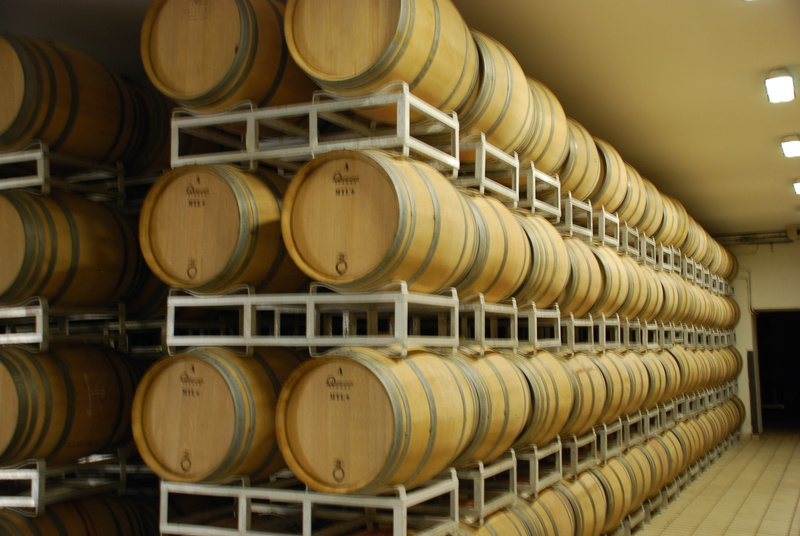 Not all of the wines are matured in oak barrels: it depends on what properties are required in the finished product. 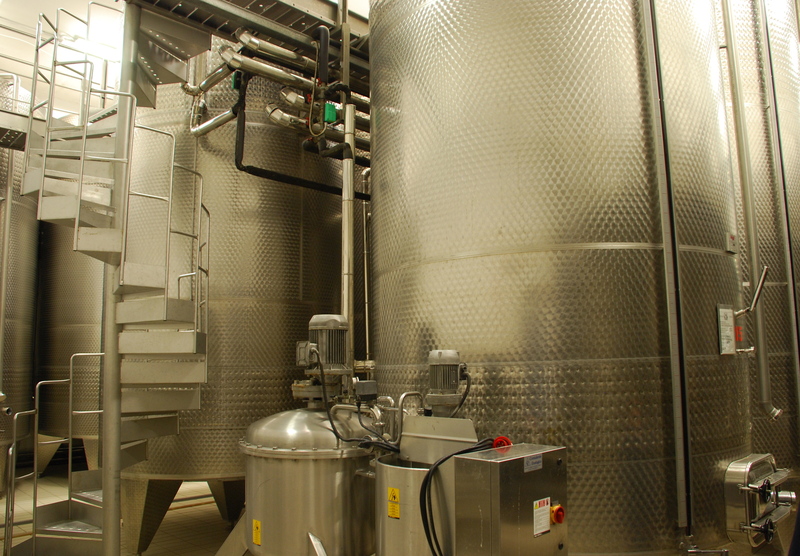 The bottling plant can produce 3000 bottles per hour, although it does not operate daily; the schedule is dependent on time of year (for example the period before Christmas is very busy) and the extent of orders. 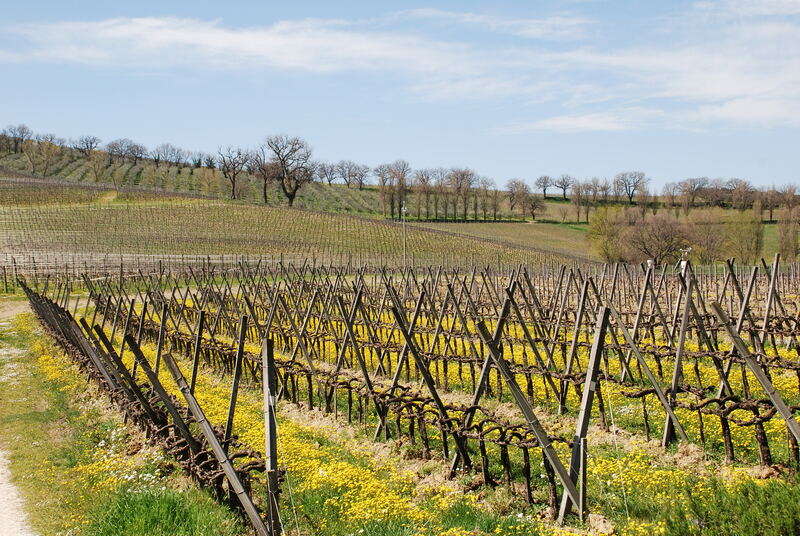 Although the Winery has continued production throughout the financial crisis of recent (and current) years, sales in Italy have shown a decrease, particularly for wines in the medium price range, but this has been somewhat mitigated by improved overseas sales. And so to the tasting, accompanied by delicious meats, cheeses and bread. We tasted 4 wines: one white and 3 red. Wine tasting selection, Arnaldo Caprai Winery. I’ll play this hand! First up was the white Grecante, 2011, made from 100% Grechetto grapes and aged for 3 months in steel vats and a minimum of 3 months in the bottle. Fresh and crisp, slightly acidic with a grassy overtone and very delicious. Serve as an aperitif, or with fish or poultry. 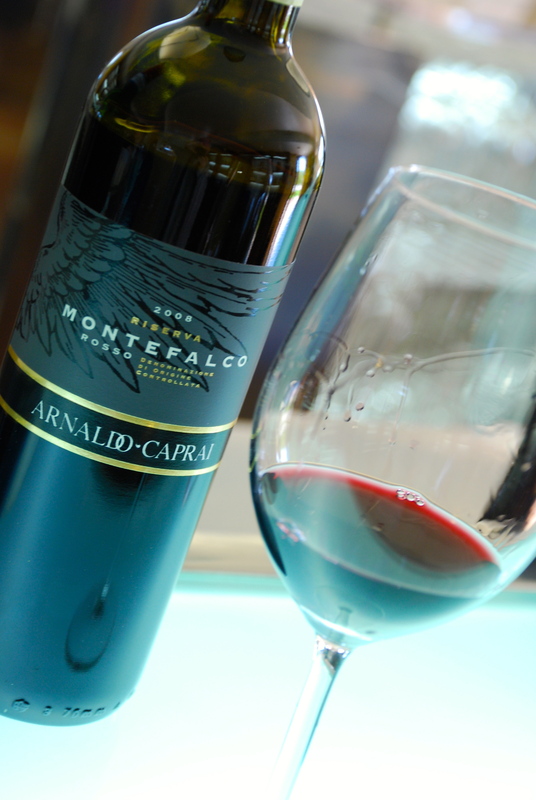 Next we tried the Montefalco Rosso, 2010, a blend of 70% Sangiovese, 15% Sagrantino and 15% Merlot grapes. This is aged for 12 months in wood (70% of the time in Slovenian oak barrels and the remainder in French oak barrels) followed by a minimum 4 months in the bottle. The oak came through slightly but it was mellow with a subtle flavour. A perfect match with red or white meats, charcuterie or mature cheese. We moved on to the Montefalco Rosso Reserva, both the 2007 and 2008 vintages. The Reserva is the same blend of grapes as the Montefalco Rosso, but it is aged in oak for a longer period: 20 months in French oak barrels and a minimum of 6 months ageing in the bottle. Well-rounded, structured wine with subtle oak overtones and a long finish on the tongue. An excellent wine which would pair well with roasted meats, charcuterie and mature cheese. Finally, the best of the bunch (no pun intended!). Collepiano Sagrantino di Montefalco. Made from 100% Sangrantino grapes and aged for 20-24 months in French oak barrels with a minimum of 6 months in the bottle. Robust, potent and rich in tannins, it exploded with flavour but had a velvety smooth finish. Best accompanied by food; serve with good roast meats or game and mature cheeses. Mio marito is very happy! 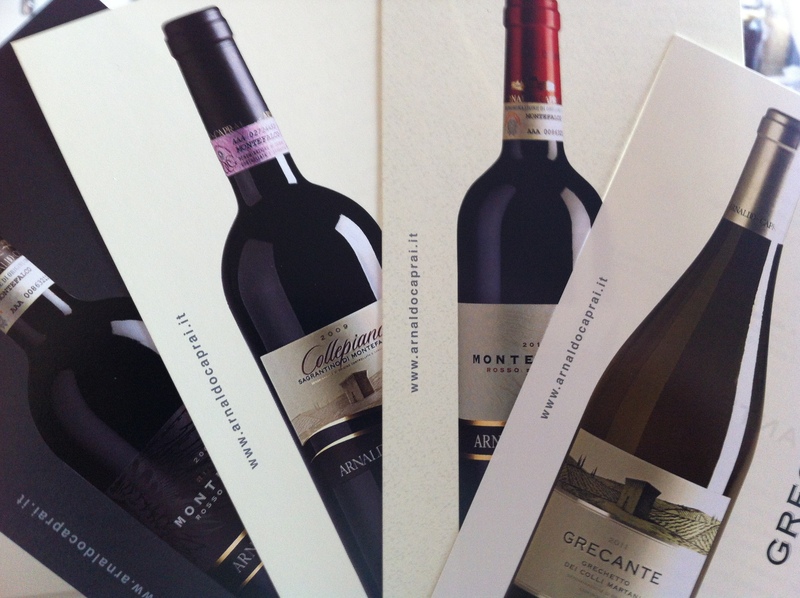 Of course we liberated 2 cases of wine – 3 bottles of each one that we tested. Point of interest: in Italy a case of wine comprises 6 bottles not 12, in case you thought I couldn’t add up! Time to reflect on our perfect day and to eagerly anticipate sharing the wines we took away with us. Mini Adventures. Arnaldo Caprai Winery, Montefalco. This entry was posted in Italian Life, Umbrian Food and Drink and tagged Arnaldo Caprai, Grechetto, Milan University, Mini Adventures, Montefalco, Oak, Sagrantino, Sagrantino di Montefalco, Sangiovese, Umbria, Wine Tasting, Winery on April 12, 2013 by maryshoobridge. Sounds totally fantastic. I trust you will be bringing some home for us to sample at book club. Does ‘mio mario’ resemble a happy labrador in a lamp post factory? Seriously though it sounds like a great way to spend time! How fantastic. I guess you now know quite a bit about Italian Red Wine, which hopefully you will be able to share (both wine and knowledge) with your friends. Lovely photographs accompanying the blog. 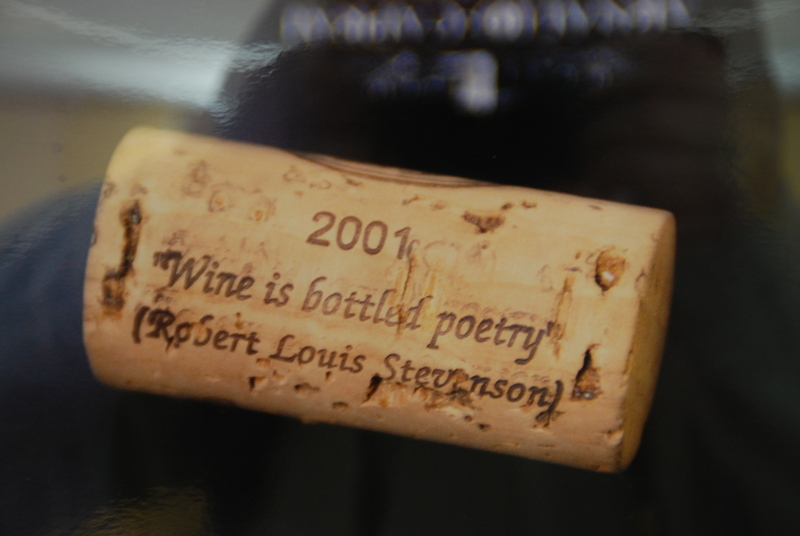 Oh, for someone who loves wine this sounds like heaven. But then Italy is at least when it comes to wine.